Have a horse without all of the responsibility of a live horse with our topiary option. The mossed horse topiary comes in the following heights: 17", 26", 37", 49" and 72". 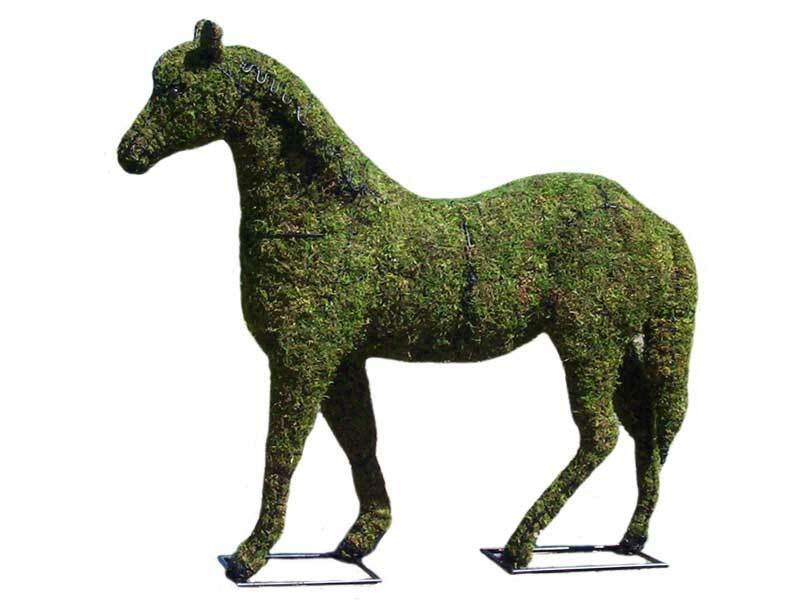 The simple black topiary frame horse comes as 17", 26" or 72" high. Our Horse Topiary Our topiaries set the standard in design and attention to detail in each of our Hand Crafted, Powder Coated Wire Frame Topiary Sculptures. Our Topiary sculptures are available in a variety of styles including Frame (which is our metal frame Topiary, left empty - ideal as gift baskets, special event or garden sculptures), Mossed (which is our metal frame Topiary filled with pre-dyed Sphagnum Moss - Perfect for planting) or Lit (which is our metal frame Topiary wrapped in clear mini lights for Holiday or Event decorating). All items are manufactured in sections which help with shipping costs and also alternative planting options. Most of our topiary animal forms come in a variety of sizes and shapes. We can also custom make a horse topiary to any size your heart may desire! Note custom made topiaries are handmade with 1/4 metal with optional galvanzied coating to protect against weather elements. * NOTE: As every topiary is handmade, all dimensions shown are approximate and may vary slightly making each one "One Of A Kind".